Over the years, Global Basecamps has been recognized by experienced travelers and clients as one of the world's best travel companies. Today, National Geographic Traveler agrees. The world's premier travel publication has chosen Global Basecamps "Beyond the Big Five" trip as one of 2014's 50 Tours of a Lifetime. This annual award is reserved for companies that demonstrate a higher understanding of cultural travel, sustainability and innovation in the travel industry. 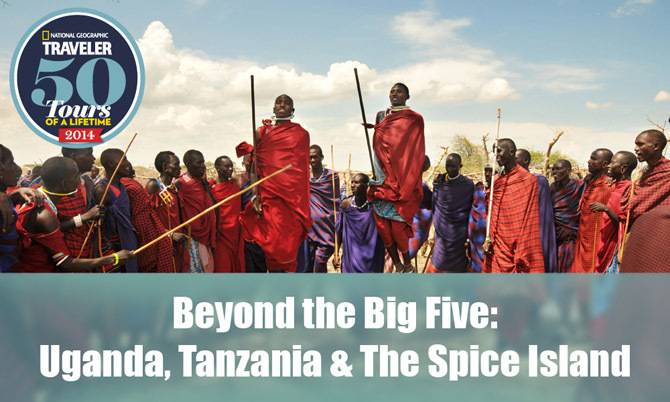 On this Tour of a Lifetime, travelers will bounce from trekking with mountain gorillas in Uganda's Bwindi Impenetrable Forest, to mingling with Maasai warriors on the plains of Tanzania's northern national parks, to lounging on the beaches of Zanzibar. We couldn't be prouder of this acknowledgement. Check out the rest of the list here.